We are leading supplier of Bottle Labeling Machine. Bottle labeler is operated by rotating the bottle and the label is dispensed and applied at rotation speed for labeling of a bottle. It ensures an accurate, wrinkle-free, smooth labeling. These are suitable for medicine, beverage, food and chemical industries. Further these can also be used for plastic. 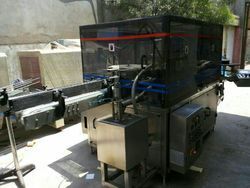 Filling capping and labelling machines by shree bhagwati machtech india ltd. Being a well-established organization, we are engaged in trading a distinguished range of Bottle Labeling Machine. Note: Price may vary according to size and specification. - Machine suitable for round products like vial / bottles / jars / tin and container. - Any type of products like aluminum / glass / plastic can be accommodated. - Full/Partial or body labeling is possible. - Products of minimum 15 mm diameter and onwards can be utilized. - Output speed upto 60 BPM. Automatic Bottle Sticker Labeling Machine to stick self adhesive label on 250 ml to 500 ml Bottle (cGmp Model). v Structure of SS 304. We are the leading manufacturer & supplier of Flat Bottle Sticker Labeling Machine. no change part require for change over. no bottle - no label system. Designed for 3000-15000 Bottles / Container per-Hour. Rowmatic-SPL Non Cylindrical bottles and Containers-is simplest most economical and efficient Widely used in LIQUOR industry for applying single label on Flat / Elliptical/Square / Rectangular and other similar shape bottle of any size and height. : B) 0.25 HP/1400 RPM motor for pressing device drive. : C) 6V DC stepper motor.